Lights! Camera! Carter! 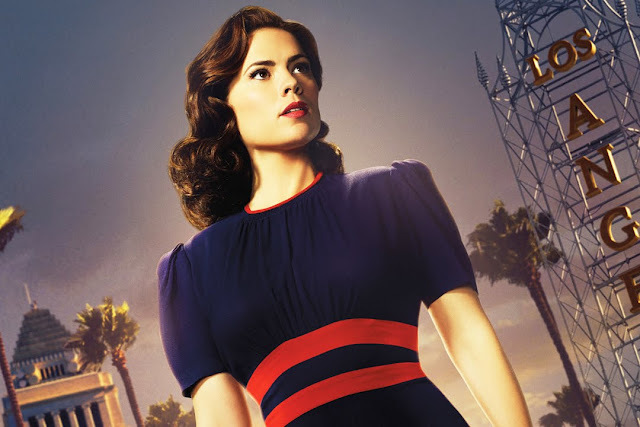 Agent Peggy Carter is back for her second season, and this time, she’s taking on Hollywood. Spoilers ahead – proceed with caution. The events of season one are still fairly recent, and we pick back up with the dastardly Dottie Underwood. (Because plummeting out a window into a plane hangar wasn’t enough to finish her off. Naturally.) Within the first five minutes, there’s a knockout fight between the hated villainess and our beloved Agent Carter. Things are looking promising for Peggy’s mission when Agent Thompson feels the need to interfere. Since the death of Chief Dooley in the first season, both Agent Thompson and Agent Sousa have been promoted in the SSR. Now chiefs, Thompson oversees the New York office while Sousa is stationed in LA. Los Angeles isn’t all sunshine and Hollywood stars, though. Sousa is soon faced with a case too big to crack alone. He calls for backup, and Thompson takes the opportunity to foist off Peggy. 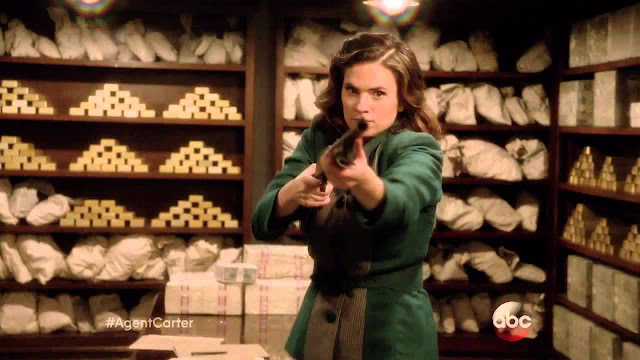 Agent Carter is reluctant to leave, since she’s finally making progress with Dottie’s interrogation. Thompson insists he can handle it and lies to Peggy about the LA mission so she has no choice but to leave New York. She steps off the plane to be greeted by everyone’s favorite butler, one Edwin Jarvis. There’s also a new addition to the Stark (or perhaps more accurately, Jarvis) family: Bernard the flamingo. Jarvis really deserves a salary increase for everything Howard Stark leaves him to handle. The flamingo is hardly the strangest thing Peggy will be facing in Hollywood, though. She’s quickly briefed on the case and realizes that it was thanks to Thompson and not Sousa she was assigned to Los Angeles. In spite of being assigned this case against her will, Peggy jumps in right away. As Peggy makes progress in LA, Thompson makes a mess in New York. For once, I agreed with Dottie when she told the new chief to bring Peggy back. To further complicate the already botched interrogation, the FBI swoops in and announces the SSR is off the case. 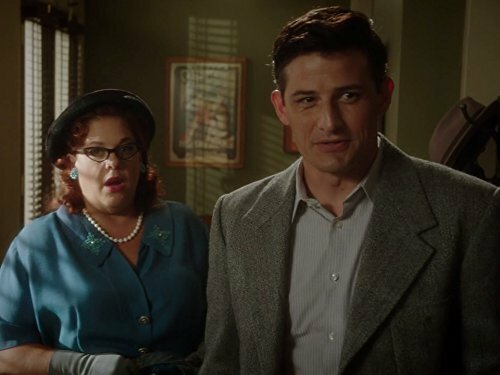 It stinks for the SSR, but Thompson pretty much deserved it for trying to cut in on Agent Carter’s case. Again. I digress. Back in Los Angeles, something sinister is brewing. The body of a young woman was discovered in a lake. If that isn’t disturbing enough, the lake is frozen... In the middle of a California summer. Peggy’s probing puts her on the path of atomic threats. Somehow these unexplained deaths are wrapped up with a nuclear plant. 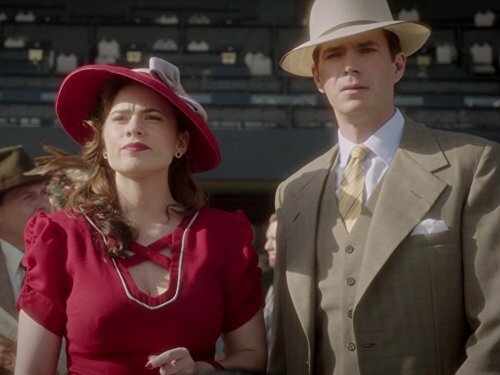 Agent Carter will do anything to solve the bizarre occurrences, even accepting a date with a friendly physicist. Hollywood isn’t all movie screens and palm trees, and Peggy is determined to get to the bottom of this act. By the end of episode two, a portion of the mystery is solved, such as how the lake was frozen. (I’ll never tell!) The promise of a bigger threat lingers just ahead, though, and I’m interested to see what the true mission will shape into. 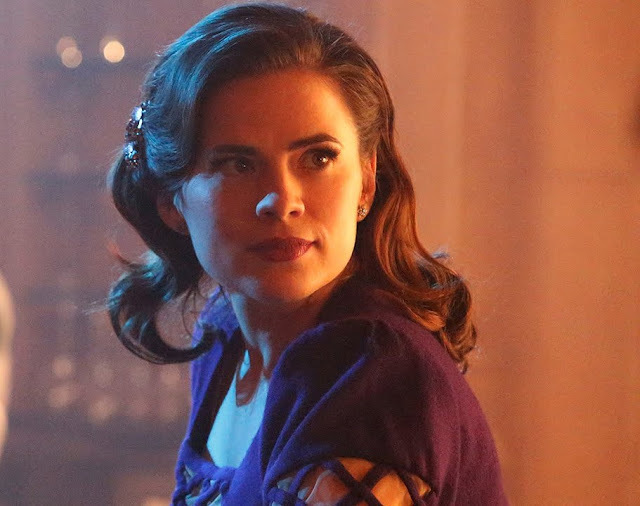 Peggy Carter is still fabulous, and I still want to be like her when I grow up. Jarvis is still my favorite. I was really surprised we got to meet the mysterious Mrs. Jarvis! Since we never saw her in season one, I remained skeptical about her existence. She certainly was not what I expected. I haven’t decided exactly how I feel about her, but she’s been a friend to Peggy, so that makes her a friend of mine. Sousa has an almost-fiancé! I’m okay that he isn’t with Peggy, because I never really shipped them. His new interest is sweet and adorable; therefore, I don’t trust her. Time will tell. I hope she really is all she seems, but when is that the case? While I’m on the subject of not shipping Peggy, I didn’t ship her with that physicist ether. I spent the entire time distrusting him, which I later felt guilty for. But the chemistry just wasn’t there for him and Peggy, or at least it wasn’t given enough time to play out. Overall, I’m looking forward to what Season Two has to offer. I’m not in love with it the way I was with Season One; it hasn’t drawn me in quite as intensely yet. However, it’s shaping up to be rather different than Season One, and that has a draw all its own. I’m still anticipating a resolution with the devilish Dottie Underwood. And I would actually like to see Howard Stark again. There’s a sentence I didn’t expect to say. Tune in for Episode Three this Tuesday at 9PM EST on ABC!